Bike hire is the most common way to get around (after walking of course). They can be hired by the hour, half day or day. It takes 30 to 45 minutes to whizz around the lake on a bike, so if you are pressed for time, that could be one solution. There is a variety of bikes to choose from, and process vary, but this is a competitive service and the pricing is pretty good. Around the bus station there are several shops with rides available. You can also hire long-boards, scooters and the most recent addition is e-Bikes. If you want something more adventurous try an e-bike tour. More information at www.ebiketour.si. Tourist Train costs €5 and takes around the lake in about 25 minutes. You can hop on and hop off only once. Horse drawn carriage will cost €50, but up to 4 people can travel together. You will find the coachmen (fijaker) beside Festival Hall. There are 321 bodies of water in Slovenia classified as lakes. There is only one lake island. 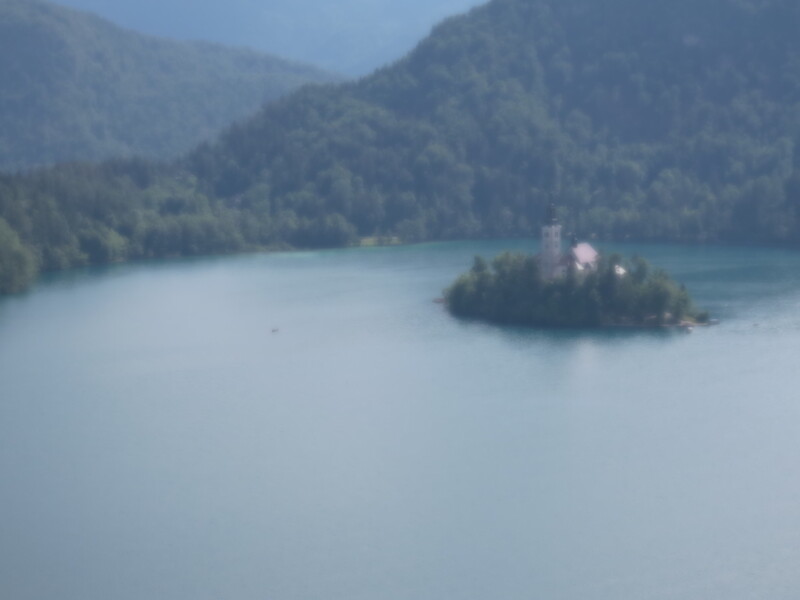 There are river islands, an underground lake island and constructed islands, but the island in Lake Bled is unique. Pletna: The traditional way to visit the island is by pletna, a flat-bottomed boat with a colourful canopy rowed by a pletnar standing at the stern. The design of these boats is unique to Bled. The cost is €14 for adults and €7 for children. However, your time on the island is limited to 40 minutes, and you return with the same pletnar. The journey lasts between 10 and 20 minutes each way depending on your point of departure. There are several pletna piers around the lake. Probably best to start with the pier behind the Park Hotel where there are usually two pletna in constant use. The pletnar will decide the time of departure when there are enough passengers. There is a larger pletna pier in Mlino, but it is more usually used for organised trips. Hydrobus also leaves from the same pier on the hour 10:00, 11:00, 12:00, 14:00, 15:00, 16:00, 17:00, 18:00. Adults pay €11, children €6. You should talk to the operator about how long you can stay on the island. Rowing Boat: There are a few places to rent a boat around Mlino and the Camping Site at Zaka. The main advantage here is not only price per person, but the time you spend on the island is your choice. Boat hire is usually about 2 hours. Swim: Yes, you can swim there, but you cannot go on the island wearing a swimming suit. There are many legends and stories about the island, but I’ll keep to a few facts here. The Church of the Mother of God on the Lake is the beautiful building sitting on the island – it is surprising how many pictures online call it Bled Castle (which is at the top of the cliff). The first church established there was in 1465 more than 400 years after the establishment of the Castle. Inside there are several small side chapels, reclaimed artefacts and of course the Wishing Bell. Pull the rope, ring the bell, make a wish. You can also climb the renovated clock tower, after climbing the 99 steps to get up to the church, but souvenirs and coffee. It is a place of pilgrimage. It has been regarded over the centuries (including pre-Christian times) as a holy place. That seems too often to get lost in the tourism and commerce. With luck and patience, you will find a quite corner if that is what you are looking for, to take a moment’s reflection. There is more about the island, its stories and pletnar late in this book. The Tourist Information Centre is in the main shopping area beside the Casino. The staff are very friendly and knowledgeable. They will have information about what is going on in Bled and the surrounding area. They will usually help you with other questions about Slovenia. You can also hire a bike or car (Hertz). Opening times: Spring and Summer, every day from 8.00 am to 6.00 pm. Rest of the year every day from 8.00 am to 4.00 pm. There is a permanent exhibition about the Triglav National Park, a book and souvenir shop, and a nice little café. If it is a rainy day and you want to spend an hour pottering around, looking at gifts to bring home or just kill time, this is a good place to visit.